O God, whose blessed Son became poor that we through his poverty might be rich: Deliver us, we pray thee, from an inordinate love of this world, that, inspired by the devotion of thy servant Clare, we may serve thee with singleness of heart, and attain to the riches of the age to come; through Jesus Christ our Lord, who liveth and reigneth with thee, in the unity of the Holy Spirit, one God, now and ever. O God, whose blessed Son became poor that we through his poverty might be rich: Deliver us from an inordinate love of this world, that we, inspired by the devotion of your servant Clare, may serve you with singleness of heart, and attain to the riches of the age to come; through Jesus Christ our Lord, who lives and reigns with you and the Holy Spirit, one God, for ever and ever. Clare Offreduccio, born in 1194, was the daughter of a wealthy family in Assisi. When she was eighteen years old, she heard a sermon by Francis of Assisi, and was moved by it to follow the example of the Franciscan brothers and vow herself to a life of poverty. Her family was horrified, and brought her back home by force; but one night, in a gesture both tactical and symbolic, she slipped out of her house through "the door of the dead" (a small side door that was traditionally opened only to carry out a corpse) and returned to the house of the Franciscans. Francis cut off her hair, and placed her in a nearby convent. Later a house was found for her, and she was eventually joined by two of her sisters, her widowed mother, and several members of the wealthy Ubaldini family of Florence. Clare's best friend, Pacifica, could not resist, and joined them, too. The sisters of her order came to be known informally as Minoresses (Franciscan brothers are Friars Minor = "lesser brothers") or as Poor Clares. 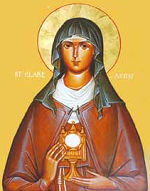 When the order was formed, Francis suggested Clare for the Superior. But she refused the position until she turned twenty-one. They devoted themselves to prayer, nursing the sick, and works of mercy for the poor and neglected. They adopted a rule of life of extreme austerity (more so than of any other order of women up to that time) and of absolute poverty, both individually and collectively. They had no beds. They slept on twigs with patched hemp for blankets. Wind and rain seeped through cracks in the ceilings. They ate very little, with no meat at all. Whatever they ate was food they begged for. Clare made sure she fasted more than anyone else. Despite this way of life, or perhaps because of it, the followers of Clare were the most beautiful young girls from the best families of Assisi. The community of Poor Clares continues to this day, both in the Roman and in the Anglican communions.